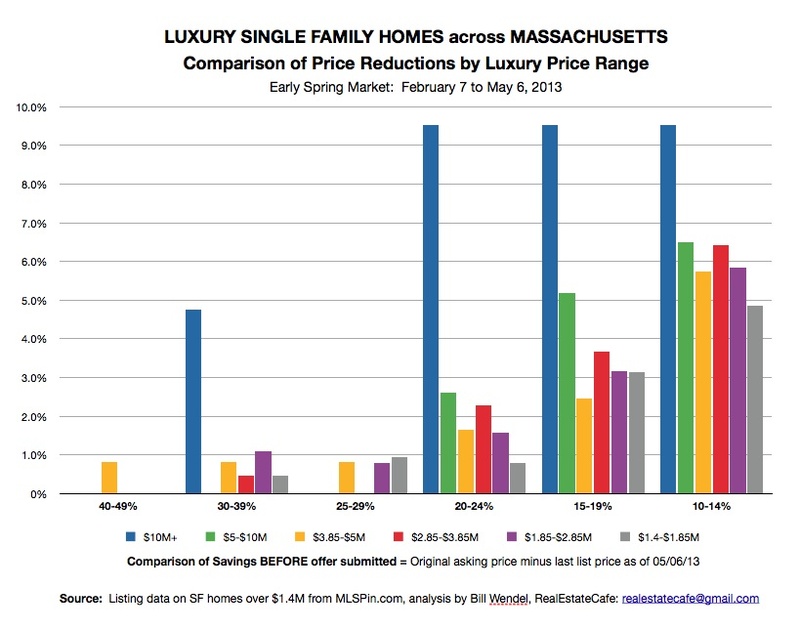 Home › Bidding wars › What’s really happening with luxury single-family homes across Massachusetts? Before cynicism morphs into contempt, remember neither can inform home buying decisions, particularly offers, without competent, comprehensive, objective research. That’s why one of the Real Estate Cafe’s missions is to protect homebuyers by questioning assumptions, debunking half truths, exposing facts and posing counter arguments. 1. Last week, tech-darling Redfin issued a press release on the luxury housing nationwide that was republished by the Wall Street Journal and other publications. According to one of their local agents, “The luxury market in Boston is seeing the same level of competition and shortage of homes for sale as the rest of the market.” Really? That comment echoed the Mass. Association Realtors who said, “Buyers came out in force to make offers on the limited number of homes for sale in April.” Limited, really? Not in the luxury price range; at least not for single-family homes. Fact 1: Our analysis of single-family homes priced over $1.4 million shows approximately two years of MLS inventory based on sales during a three month period ending May 6, 2013. Unsold inventory varies by price tier, from 16 months in the $1.4 to $1.85M price range to 57 months — or nearly five years — in the $5 to $10M price range. Fact 2: MLS stats show that Redfin was only involved in one closing over $1.4M in Massachusetts between 2/7/13 and 5/6/13, so maybe their assessment is based on luxury condos (which were not included in our ongoing analysis). Fact 3: During the past three months (2/7/13 – 5/6/13), less than 10% of single-family homes sold over $1.4M were over asking price — that’s a mere 15 sales across Mass! Fact 4: Only 7 of those 15 homes sold for more than 2% over the seller’s asking price! Big deal, right? Fact 5: One of the two listings featured in Hammond’s press release had been on and off the market for more than a year and a half before selling for $2 million — or more than 36% — below it’s original asking price of $5.5 million in September 2011. Would you believe the final sales price was also $777, 800 below the assessed value published in the MLS? As that sale proves, it’s still possible to get a single-family home in Massachusetts for approximately $1 million below it’s original asking price. 3. So our question is why “bid as much over-ask as you can,” when less than 10% of luxury single-family homes sold during the past three months were over asking price and when you may still be able to save six to seven figures? Fact 7: As our graph above shows, price reductions of more than 10% are common across all six luxury price ranges studied in our three month snapshot. So why does the press focus on the seven sales more than 2% over asking price, when 205 luxury single-family listings have reduced their asking prices by at least 10%? Fact 8: Almost 15% of the homes priced over $10M have reduced their asking price by more than 20%; so apparently the more money you can spend, the more you can save! Fact 9: Would you believe that 37 luxury single-family homes across MA have reduced their list price by approximately $1M off the original asking price, and another 67 have reduced their price by approximately one half million? Compare our fact checking above to industry statements and ask if there is a point at which real estate spin becomes false advertising or part of a pattern of deceptive trade practices? Fact 10: Only a handful of bidding wars drove prices $100K or more over asking price on luxury single-family homes in Massachusetts during the three months studied. Fact or just our professional opinion? For the second year in a row, an unsettling number of those involved in-house sales at well-known real estate brokerages. Won’t it be wonderful if the same press released announced, “Federal and state regulators are investigating the role that dual agents and designated agents — aka “counterfeit buyer agents” — play in manipulating buyers, particularly in-house buyers, involved in bidding wars”? Rounding up, our research defines “Million Dollar Markdowns” as listings that have been reduced by $850,000 or more from their original asking price; and half million dollar markdowns were reduced $450,000 or more. This blog post was written before learning about the lead story in Banker & Tradesman entitled, Luxury Market Soaring, dated tomorrow, Monday 5/20/12. Unfortunately, we are not subscribers so cannot access that article online. That article should be worth reading because it will most likely include all residential sales in Massachusetts, whereas our three month snapshot was limited to listing data published by MLSpin.com which covers most but not all of the state.